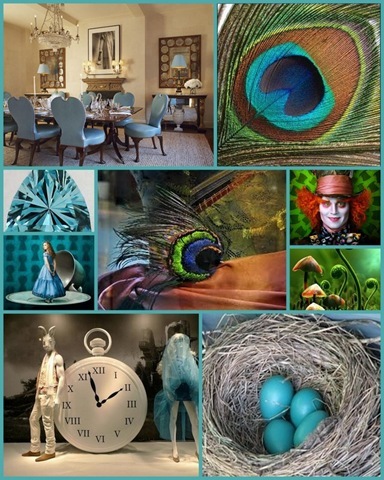 Photo Credits: House Beautiful, Google search, Johnny Depp Alice in Wonderland,Peacock feathers, AquaMarine, Bottom left: Source Unknown. 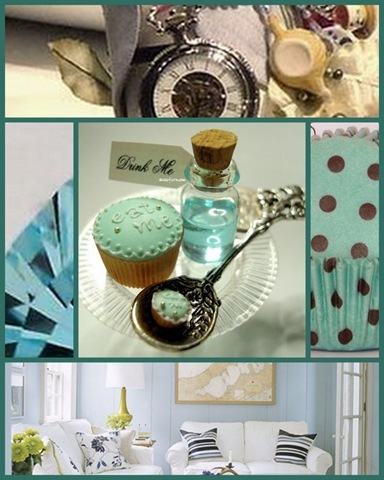 Bottom Right:Patricia Gray Inc.
Photo Credits: House Beautiful palette aquamarine; Vivienne Westwood Shoe4;Mimosa Reversible Bedding in Aquamarine Zgallerie Bedding; Google Search Aquamarine,Peacock feathers,Alice in Wonderland; Cake designed by PinkCake Box; Nicholas Kirkwood Designer Shoes. 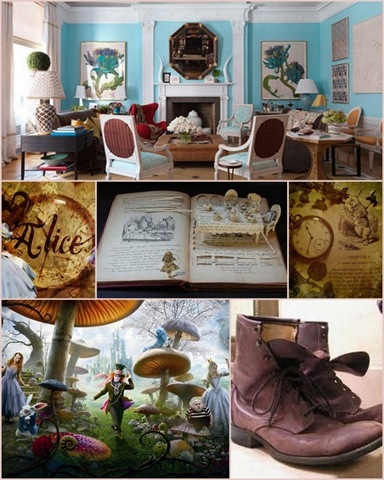 Photo Credits:House Beautiful; Favim .com search: Alice in Wonderland, Source Unknown. Have you seen Tim Burtons magical take on the 19th century Lewis Carroll’s, Alice in Wonderland.? Such wonderful costumes, make up, visual and art direction, but the colours are just so vibrant, one of the colours I focused on was Aquamarine and tones of it. 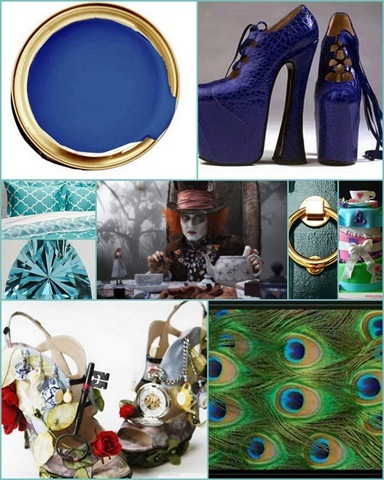 … A pale tint of Spring – tonal to Cyan, a calming,relaxing colour. (Source: Wikipedia). When you watch movies full of visual resources, what do you see. Do you only ‘watch’ the movie? Do you see and give credit of how much screen and visual work has gone into the making of the movie? Do you think ‘wow, look at all those special effects’? Starting with one focus point: being colour, can lead into new inspirations. Where do you get your inspirations? Isn’t it amazing how you see something and it triggers a thousand thoughts. I’d love you hear your thoughts or maybe share your links. How fantastic! 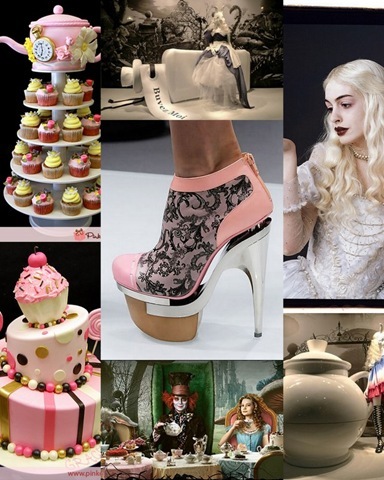 All of these things are beautiful and so fanciful! LOVE LOVE LOVE the cake and cupcakes! Yvette, this is so beautifully put together! Aquamarine is such a magical colour. I love this remake of Alice in Wonderland. What a great selection of inspiring images you’ve put together! Love that drink at the end. I was never much of a blue person until this year, now I have a blue accent wall in my LR and LOVE it! I think I love this ticket to wonderland and I believe I love this blue. Those colored eggs look amazing and those chairs are beautiful. I just adore your palettes.. I find inspiration everywhere! and today I found it here – thanks Yvette for an inspiring post!